Forests have long been places of trial, enchantment, and danger in stories from The Epic of Gilgamesh, to Grimms’ Fairy Tales, to movies like The Company of Wolves (directed by Neil Jordan) and The Wolfman (directed by Joe Johnston). The first forest scenes in both these movies pull at the mystery and danger of entering the forest unprotected. Forests are also connected to magical or cunning predators like wolves, giant spiders, and bears. In earlier eras, forests were literally filled with wild beasts, hidden pitfalls, and robbers. People usually entered the forest only through necessity or travel, and preferably only during daylight. Forests are also places to experience transformation. In many forest tales, heroes and heroines enter the forest, often reluctantly, like Bilbo in Tolkien’s The Hobbit, and emerge transformed as they overcome dangers and fears. Confronting, facing, and naming our fears (like in Ged in Le Guin’s The Wizard of Earthsea) is one of the most terrifying and necessary catalysts to personal growth. Naming and mapping fears can be a vital step toward making peace with them. What are you afraid of? What part does fear play in our biology? Why has the forest been a setting for so many myths, legends, and folk tales? What are your darkest places? What kind of trees are in your forest? What kind of beasts? What dangers? Is there a cottage to provide you shelter? Are there any benevolent or magical beings in your forest? What are our modern “forests” (elements of our modern world that we are taught to fear)? 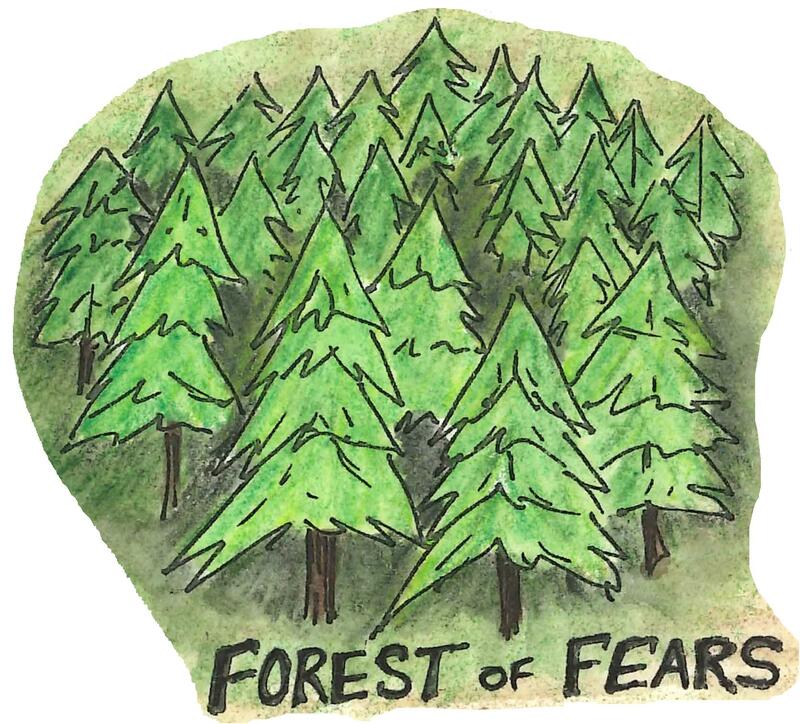 How do these fears and these ideas of the forest correlate to your Personal History? What would your Forest of Fears look like if mapped? Here is a gallery of forest of fears maps and fear images. My deepest thanks to the artists for sharing their fears.